Graphic errors in forza 7 with 17.11.1 and 17.11.2 went back to 17.9.3 and so far no issues. I appreciate the gesture, as effective as VBIOS modding is for the HD 7900 series, the VBIOS method still doesn't solve the UVD issue. You don't need to go through anything more with me regarding VBIOS mods as I have been VBIOS modding from the AGP era where you could turn a X700 SE card to a X700 Pro, or Softmod a 9550 to a 9700, and more. I have tried this method before and it simply doesn't get rid of the issue. But to each to their own. And the rest of what you said is exactly what I said, I think. Whether the UVD bug has the effected card simply getting stuck at State 2 or the #5 & #6 within state 1 is probably the key to solve this. Sorry, I forgot you had a 7950. 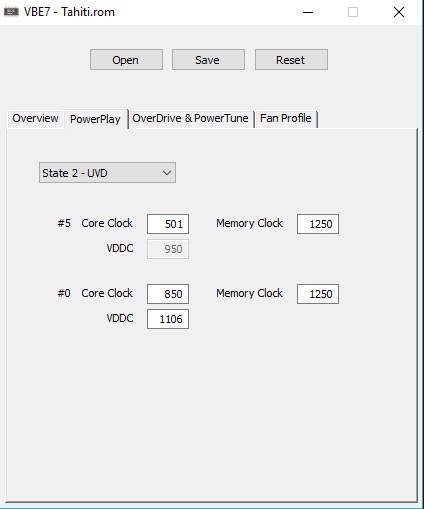 When I read 850MHz I wasn't thinking of stock a max 3D clock for the 7950 model, but the base non boosted clock for a 280X or 7970 GHz which is similar to its highest UVD clock (that when gets stuck, doesn't let the card reach 1000/1050MHz, the native boosted 3D clock). So your previous post was spot on. 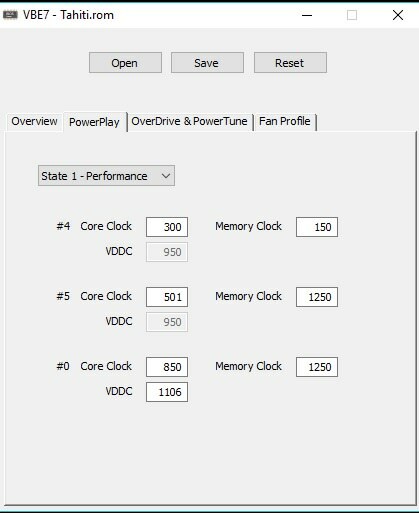 From my previous response, you can just look at the suggestion to set the lowest UVD clock as 300/150 instead of 500/1250, so even if it'll force the card to run most times at full 3D clocks during video play or browser peak loads (as 300/150 isn't enough), it'll at least idle at a lower speed if that's an advantage to you. In my testing on a 7970, the increased vram clocks of a stuck UVD mode caused it to draw an extra 30W vs 300/150. It's quite significant. In the past I've kept reporting my UVD bug findings on current drivers, but since then I've sold the 7970 to get a RX480, and the 7870 I kept on a secondary computer has died (baked it once to resurrect it, but it only lasted 3 months). I am delighted with those drivers! I'm playing Warframe on Radeon hd 7858. It was AWFUL on any other driver. Lags every second, 2000ms for frame rendering.. But not always ;/ Sometimes I could play with no lags at all. It was just Cetus, multiplayer land, which had those lags, and a few others, and seldom lags during missions, depending on map. Believe me, Cetus is a tiny map! But lags were disallowing me to move freely in game.. Previous version was 17.11.1. Had lags, but I remember updating to this version at it was awesome for a month. until i decided to update to a newest December version.. I think it was 17.11.4 then 17.12.1 ;/ It destroyed my gameplay completely. I had to do system restoration, but it brought me to version 17.11.1. Had trouble playing for last 2 weeks, I thought it was actually the proper version but something was off, still had laggs. And when today I had unplayable lags on Cetus with lowest graph settings and tiny gameplay window (it definetly wasn't the internet connection, there was problem with frame rendering and GPU activity going to 0%! ), I decided to reinstall to THIS version. I must mention, I turn off tesselation options from both Global Settings and Warframe settings (IMPORTANT) and I put power control 20%, fans speed 70%, and I overclock to 950mhz and 1350 mhz. I turn Warframe on from Radeon options menu, with no administrator settings on both drivers, and Warframe. I'm able to play on low/high/high/high graphs again with no problems.